There are some example MAP Hyperlocal API calls that show some example calls. MAP uses OAuth for authorization and a username/password combination for Authentication. The MAP API calls can either use the OAuth username/password combination or they can use a Read Only API key that will be provided by Meniscus. MAP stores items in a tree like structure. 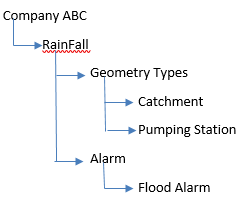 To get information about individual items the user is required to know the structure of the item tree. The following API call format will give the geometry types a customer has available. FullName. This is the FullName of the child Item. This full name can be used to return the structure of the child items. This is also used in Point Expressions. When using FullName that has been returned from the above API call, you must replace “\” with “”. ID. This is the ID of the child Item. This ID will be used later in Point Expressions. Name. The name of the child item. FullName of an Item is basically “FullName of Parent Item Name of the Item”. ParentID. The ID of the parent Item. That means Id of the Item whose FullName is used in the API call to get this structure. The URL used to return data from MAP consists of 5 main parts that are combined to form a URL comprising the Endpoint, Expression Type, MAP Expression Library and Expression. The structure of the endpoint is https:// ServerName/MAP/ReadData, where ServerName can be different depending on the URL of the required server. This part defines the return type of the expression called. API Key (e.g. demo in the example URL) will restrict the access of a user. An API Key will be provided by Meniscus. The user access rights in MAP control access to particular Expression Libraries and to particular Expressions. The expression processed by MAP. This can be built from one or more expressions nested as required to process data into the format you wanted.